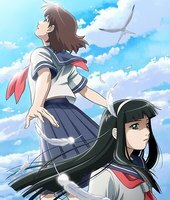 You can look at the Synopsis from AnimeNfo.com. Ray’s take: Mecha and potential yuri? I’m there! With Yukino Satsuki and Goto Yuko in there, even not as main characters, this one can’t be that bad! Alien girl learning to love and care for humans, and the human girl falling for the alien girl and the two have steamy…Ah hum, I mean learn to understand each other; throw in some concepts about understanding and learning to accept each other and we just might have a winner here, folks! With Gonzo doing the 3D (let’s hope they don’t drop the quality midway), this one should be a decent watch. For more info see here and here. My daily recommended diet preview:Â 8.5/10, potential yuri, school life, and mecha? A win-win for me. Pictures taken from AnimeNfo.com and Anime News Network. Previous PostSecret Police broke up an Otaku riot and arrested the leaders of the “Anime For the Masses” movement…Next PostAttention, Makoto Shinkai and Ouran Fans!